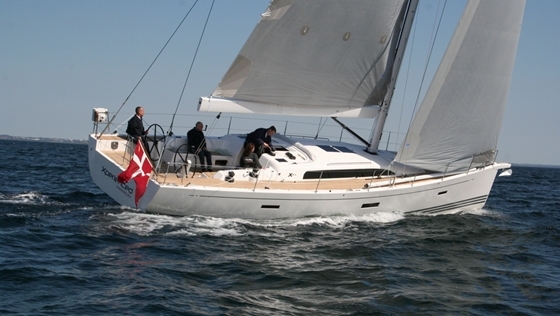 The XP 50 was one of the larger new boats at the Hamburg Boat Show, where she wowed with her appearance. 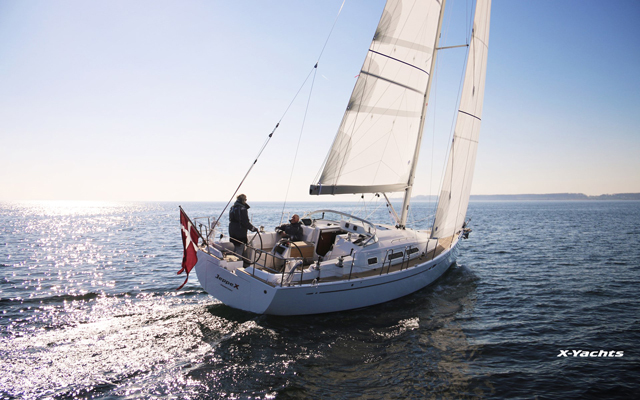 The Danes of X-Yachts had the best booth and a boat with star qualities to match, confidently thrusting forward her carbon fiber bowsprit that also doubles as a trendy anchor roller. Underneath on the hull, there was the sticker identifying her as one of the nominees for the 2012/13 European Yacht of the Year Awards. 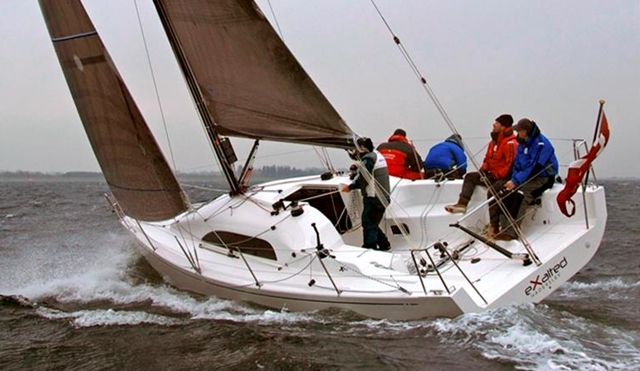 The XP 50, designed by Niels Jeppesen, carries strikingly good-looking modern lines and is a thoroughbred performer. In a crowded hall it can be difficult to contemplate the lines of a yacht, since looking up from the show floor offers a distinctly different perspective from what you’d see of a boat that’s in the water. 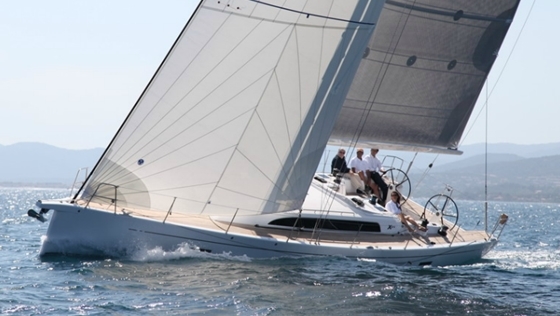 But even so, this boat, designed by Niels Jeppesen and his team in Southampton, clearly outshined others by far. The current trend in yacht construction looks for modern and clean designs to replace the old ones that tended to be ornate and overly technical. More than a decade ago, aluminum toe rails with their drilled holes started to disappear little by little. More recently, longish windows in the cabintop have replaced the multitude of smaller ones. Cockpits are more open and better organized, so everything appears smoother, cleaner, and a bit more minimalist. The XP line does not just perpetuate these developments, but pushes them to an entirely new level, which marks a clear departure from the company’s earlier models and those of many competitors. If you like this trend, you will probably find yourself liking the XP 50, too. Especially on the water her appearance is pretty, harmonious, and profoundly elegant, but also powerful, which is emblematic of her performance. During earlier test sails for the European Yacht of the Year contest in Southampton, the XP 50 proved to be a finely balanced but highly potent weapon. Steering this boat is a privilege. The carbon-reinforced floor arrangement provides extreme stiffness, which is a quality that also distinguishes the smaller models of the XP line. Each increase in pressure is perceptibly turned into forward motion. 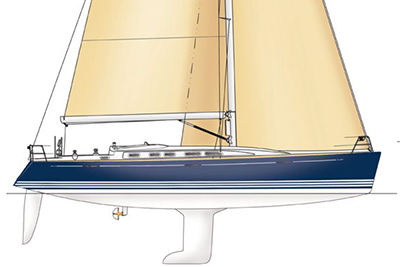 The pounds that were saved by consistent lightweight construction of hull and interior were moved into the keel bulb, which is another reason for the boat’s stiffness. With optional electric winches, the immense power of this boat can be harnessed by a small crew. But some experience and a bent for sporty sailing on the part of the owners will be helpful, as will some readiness for sacrifice. The interior is not spartan, but comfort levels are not markedly increased over the XP 44. 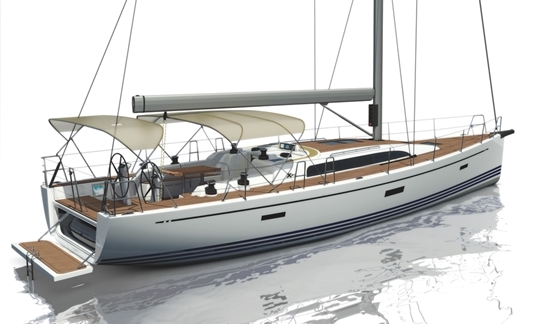 That’s because the XP 50 is kept simple belowdecks, at least compared to the standards of other high-end 50-footers. The arrangement of cabins appears sensible, and all important comfort measures found consideration. But there is not significantly more space or luxury than on the XP 44. Even the fold-down nav desk is still there, which one would expect from smaller boats that are cranked out in large numbers. However, this is the only limitation. 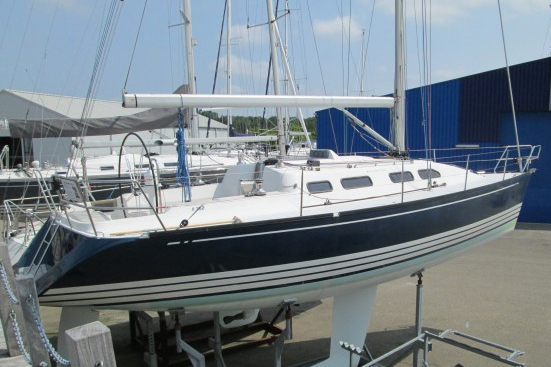 For anyone who can easily part with 592,650 euros and a bit more for sails, electronics, and other options, a dreamboat doesn’t have to remain a distant dream. All others might want to take a closer look at this boat during one of the coming boat shows. 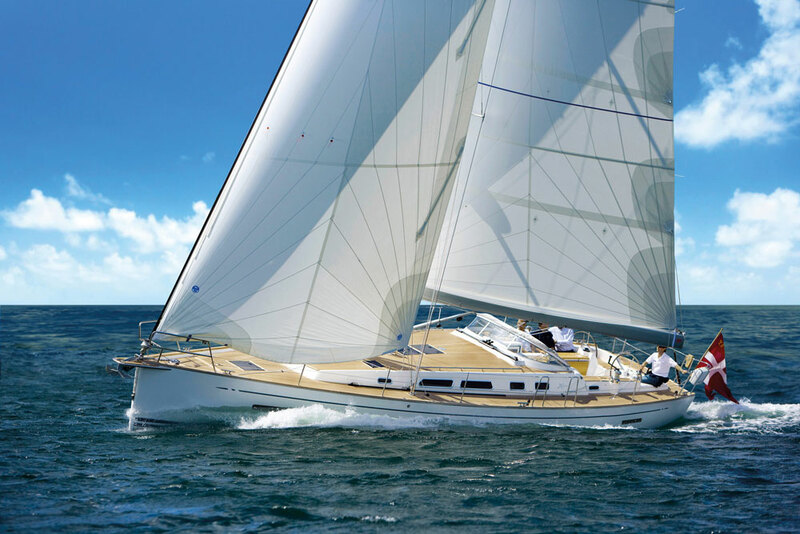 For more information visit X-Yachts. Mainsail (alloy rig): 87.6 m2 / 942.95 sq. ft.
Mainsail (carbon rig): 89.6 sq. m. / 964.48 sq. ft.
Genoa (106%): 64.3 sq. m. / 692.14 sq. ft.
Spinnaker (all purpose): 220 sq. m. / 2,368sq. ft.